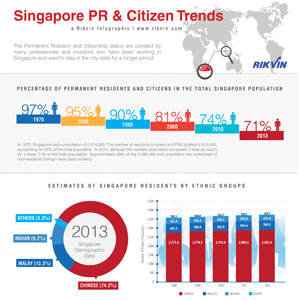 Rikvin has today issued its 5-Year Singapore Permanent Resident and Citizen Trends report. The report provides an overview of Singapore permanent resident (PR) and naturalization activity between 2008 and 2012 and is based on figures from the National Population and Talent Division (NPTD), SingStat and the Immigration and Checkpoints Authority (ICA). The report also shares a number of factors which affect a PR application and the avenues which can be pursued to achieve this status. As of 2012, there were 533,100 Singapore Permanent Residents (PRs) and 3.29 million citizens in Singapore. Singapore’s total population has grown from approximately 4.84 million in 2008 to 5.3 million in 2012. Altogether, Singapore’s total population has grown 9.5% between 2008 and 2012. During this period, the resident population has grown approximately 5% – from 3.64 million to 3.82 million. This expansion was contributed largely by the PR population, which grew by 10%. The citizen population, on the other hand, grew by 4% – from 3.16 million to 3.29 million during the same period. The proportion of residents among total population has dropped slightly from 75% to 72%. In addition, the proportion of PRs to residents in Singapore has remained somewhat steady, from 13% in 2008 to 14% in 2012. All ethnic groups saw their population expand between 2008 and 2012. However, each group experienced a weaker increase in population growth on a year-on-year basis. Between 2008 and 2012, the number of new Singapore PRs granted has decreased significantly. While there were 79,167 PRs granted in 2008, the number dropped to 29,891 in 2012. Having either PR or citizenship status comes with benefits including access to public housing, quality education and healthcare services at subsidized rates. PRs and citizens also benefit from CPF savings as well as a range of personal tax reliefs and rebates. However, attaining either status is dependent on a number of factors. “Over the years, we’ve seen a good success rate in PR applications among our clients and have noticed certain features that make them so. As such, we’ve shared them in the report so that aspirants can boost their chances at becoming Singapore permanent residents,” added Mr. Bakhda. 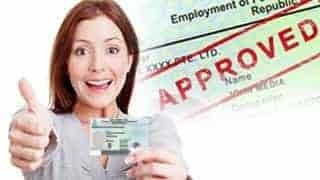 To learn more about Singapore permanent residency options, please click here.